You would think I’ve had enough home dying but I keep finding new ways and new things to dye. Plus, I left my favourite Two Colour Tie Dye Scarf behind in South Africa. I’ve been looking for an excuse to make another one. 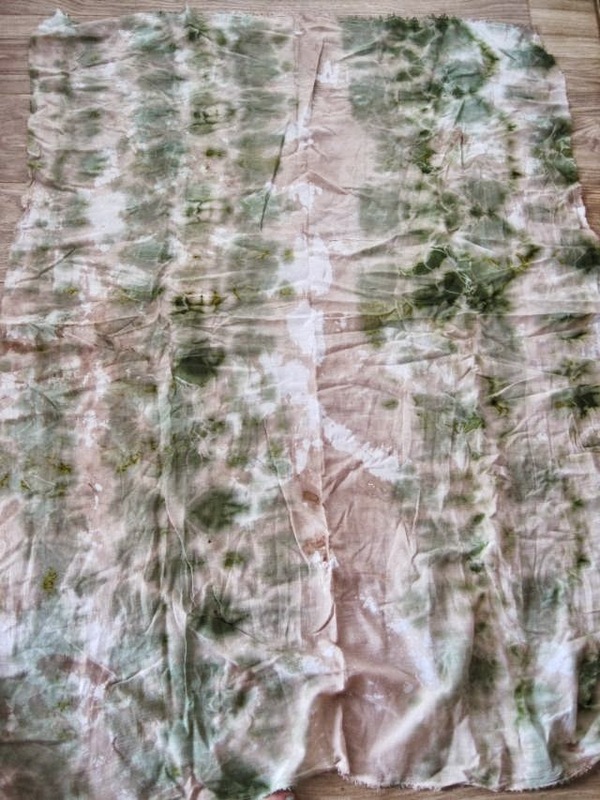 I’ve experimented with fabric paint to re-create a tie dye effect – see here. See how this blogger used fabric spray paint – Jenni spray painting. Everything I’ve learned about dying and bleaching is all in – this – blog post. I still don’t always get it right. This time around, the dye pigment wasn’t completely mixed into the water. The final results had yellow undertones and the dye was a bit patchy. On to this weeks DIY. 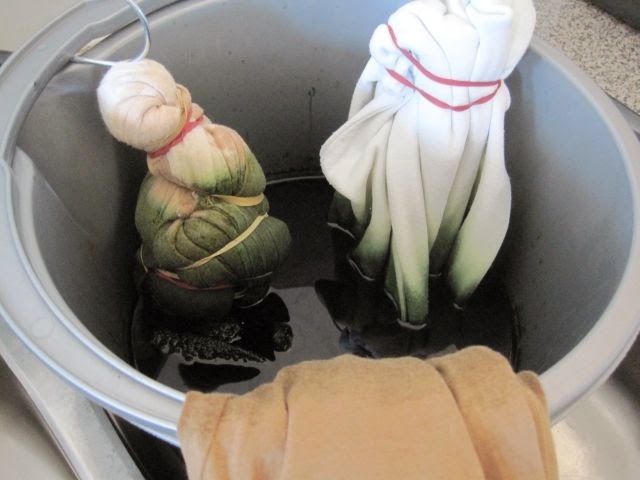 You need to dip your garment into either dye or bleach. 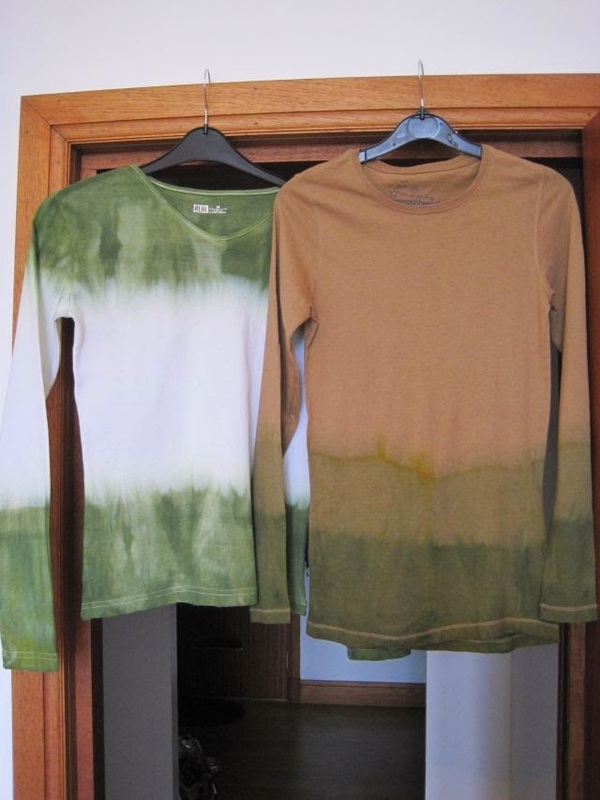 I had two T-Shirts and some muslin I wanted to dip dye. 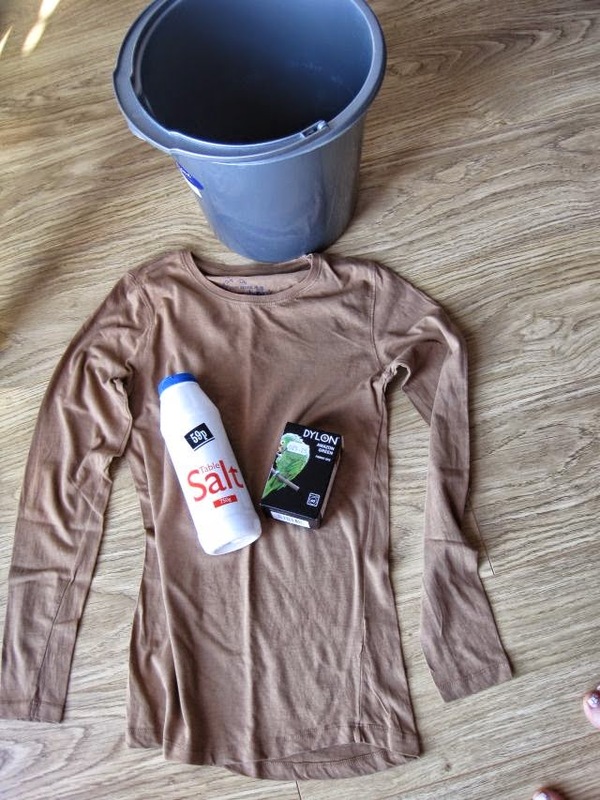 With the first T-Shirt (beige one) I only dipped the bottom of the shirt and the sleeves into the dye. But . . I dipped it into the dye quickly and pulled it out. Then dipped it again, leaving it to soak at a lower level. Doing that gave a two-tone dying effect. The second T-shirt (white one) I folded it in half. I kept the middle piece out the dye. The top part of the T-Shirt as well as the bottom part were dyed. The big mistake to avoid making with dip dying is this – make sure the sides of the bucket do not have dye splashes on them – or you will have dye spots on your garment. The latest version of my favourite scarf started off being dyed in tea, then bleach dyed, and finally dip dyed. It has multi layers of colour effects – see it at the right of this page. To see a photo gallery of past DIYs you can head back to the top of this page to the Greenie Galleries. Visit the Greenie Dresses for Less facebook page to “like” or share your restyling ideas.